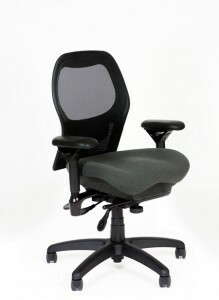 Ergonomic chairs are built with knowing that every user is different, so the chair must be fully adjustable. Proper fit is the only way that a user will discover the health benefits associated with ergonomic seating and it only takes a little bit of effort. With three main adjustable chair components, coming up with the right formula for each person is essential and well worth the time spent once that process for each component is defined. Seat Pan – A seat can be adjusted in height and angle, although some of the best ergonomic chairs also adjust depth-wise. Proper adjustment begins with a user sitting with feet flat on the floor and adjusting the height so the knees are at a 90-degree angle. The depth of the seat should be adjusted so that the edge of the seat tapers downward a few inches behind the backs of the knees while fully seated in the seat pan. If this is not possible and sitting back in the seat causes the edge to contact the backs of the legs, the seat is too deep and a different chair should be purchased. Tilting the seat pan slightly backward or forward for personal comfort is good as long as it is not so much that weight pressure is either increased or decreased from the legs and feet. Backrest – Once the seat pan is properly adjusted, finding the perfect backrest placement is next. Adjustment depends greatly on the type of backrest, whether it is a large one supporting the whole back or a smaller one meant to support only the lumbar area. The lumbar support must be correctly adjusted to comfortably fit into the lumbar area of the back; backrests are frequently adjusted too low, which defeats the purpose of the tool. It must be raised high enough to fit against the lumbar and thoracic spine and forward enough to not force a user to have to lean back to make contact with the backrest. Again, if a user has to lean back to reach a lumber support, the seat pan is too large and another chair will be needed. Armrests – Height-adjustable armrests are a basic necessity for any ergonomic chair; however, those that also move inward and outward and can be lengthened as well are much better. The correct positioning for armrests is directly underneath where a user’s arms naturally end while sitting with good posture with hands on the desk. Many seats provide armrests that are typically spaced too widely apart, which encourages bad posture if an armrest is used. They should also be long enough to fully accommodate a user’s forearm; if they are too short, the benefit is lost. When proper seating adjustment is learned, previous users who did not see any benefit from ergonomic seating may be pleasantly surprised to discover just how comfortable such chairs can be. Ergonomic chairs usually come with detailed instructions on the many different adjustment points, which allows a user to learn about the chair and how to use it for the greatest benefit! The Ergonomic Chairs Store has the Best Ergonomic Chairs You Can Find! Are you looking for the best ergonomic chairs? Call the Ergonomic Chairs Store at 979-217-3044 to experience how quality seating can positively impact most work productivity!